See a real speech at a political convention. Contrast it with the pablum we’re fed today. Summary: To see what we have become, look at what we once were. Today we look at a scene from our past, when America politics was something other than a spectator sport, centered on made-for-TV spectacles — and our politicians more than cardboard cutouts with good hair. 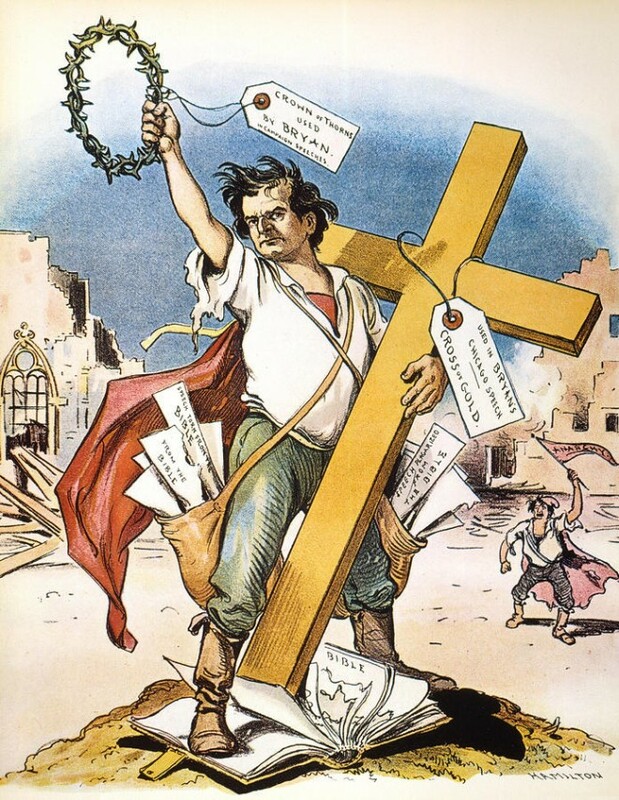 We look at William Jennings Bryan’s Cross of Gold speech. Our political conventions have become social events at which our ruling elites, minor and great, meet to socialize — renewing their interconnections and reestablishing group harmony. Conventions also provide a spectacle of wealth, power, and glamor to impress the masses. Politics, in the usual sense of the word, seldom intrudes. This explains the emphasis on mawkish sentimentality and displays of patriotism. The outsize role of candidates’ families (a recent development). The absence of real public policy debate. And the exclusion of serious political actors like Ron Paul (party-poopers). This results from the narrowing differences between the two parties, as Obama has shown. In many Obama continuation or expanded Bush Jr’s economic and especially foreign policies. There’s a large body of research by a wide range of independent agencies showing this (eg, Stratfor in August 2009). Another way to see this, less analytical but more vivid: neocons have praised Obama’s policies more strongly than has the Left. And both parties debate agree that our social welfare systems must be reduced, but differ only on how much. But these similar policies makes building partisan enthusiasm difficult. So both parties demonize their opponent.Bush Jr was Hitler. Obama is a foreign Moslem. And our conventions become song and dance acts, unconnected to the actual policies of the Republic (many of which our leaders dare not state openly). While our elections were never conventions of philosophers, they were once hotbeds of partisan debate at which vital issues of policy were thrashed out. Our politics had real public involvement because we demanded that it be so. And we can do so again, if we muster the will to do so. This is not a partisan issue, but one on which both Left and Right can agree. Perhaps through such issues we can restore the America-that-once-was. The issue here is not whether we have a gold monetary standard, but if we can banish the present phantom debates of lies and evasions and rebuild a working political system for the United States. After the experience of Team Obama, who has broken most of the pledges he made during the 2008 campaign, Democrats should agree. After the horrifying saccharine spectacle in Tampa, Republicans can agree. All that remains is to decide and act. … But we stand here representing people who are the equals before the law of the largest cities in the state of Massachusetts. When you come before us and tell us that we shall disturb your business interests, we reply that you have disturbed our business interests by your action. We say to you that you have made too limited in its application the definition of a businessman. The man who is employed for wages is as much a businessman as his employer. The attorney in a country town is as much a businessman as the corporation counsel in a great metropolis. The merchant at the crossroads store is as much a businessman as the merchant of New York. The farmer who goes forth in the morning and toils all day, begins in the spring and toils all summer, and by the application of brain and muscle to the natural resources of this country creates wealth, is as much a businessman as the man who goes upon the Board of Trade and bets upon the price of grain. The miners who go 1,000 feet into the earth or climb 2,000 feet upon the cliffs and bring forth from their hiding places the precious metals to be poured in the channels of trade are as much businessmen as the few financial magnates who in a backroom corner the money of the world. We come to speak for this broader class of businessmen. It is for these that we speak. We do not come as aggressors. Our war is not a war of conquest. We are fighting in the defense of our homes, our families, and posterity. We have petitioned, and our petitions have been scorned. We have entreated, and our entreaties have been disregarded. We have begged, and they have mocked when our calamity came. We beg no longer; we entreat no more; we petition no more. We defy them! The gentleman from Wisconsin has said he fears a Robespierre. My friend, in this land of the free you need fear no tyrant who will spring up from among the people. What we need is an Andrew Jackson to stand as Jackson stood, against the encroachments of aggregated wealth. They tell us that this platform was made to catch votes. We reply to them that changing conditions make new issues; that the principles upon which rest Democracy are as everlasting as the hills; but that they must be applied to new conditions as they arise. Conditions have arisen and we are attempting to meet those conditions. They tell us that the income tax ought not to be brought in here … They say we passed an unconstitutional law. I deny it. The income tax was not unconstitutional when it was passed. It was not unconstitutional when it went before the Supreme Court for the first time. It did not become unconstitutional until one judge changed his mind; and we cannot be expected to know when a judge will change his mind. The income tax is a just law. It simply intends to put the burdens of government justly upon the backs of the people. I am in favor of an income tax. When I find a man who is not willing to pay his share of the burden of the government which protects him, I find a man who is unworthy to enjoy the blessings of a government like ours. … If you will read what Thomas Benton said, you will find that he said that in searching history he could find but one parallel to Andrew Jackson. That was Cicero, who destroyed the conspiracies of Cataline and saved Rome. He did for Rome what Jackson did when he destroyed the bank conspiracy and saved America. … Now, my friends, let me come to the great paramount issue. If they ask us here why it is we say more on the money question than we say upon the tariff question, I reply that if protection has slain its thousands the gold standard has slain its tens of thousands. If they ask us why we did not embody all these things in our platform which we believe, we reply to them that when we have restored the money of the Constitution, all other necessary reforms will be possible, and that until that is done there is no reform that can be accomplished. Why is it that within three months such a change has come over the sentiments of the country? … Ah, my friends. is not the change evident to anyone who will look at the matter? It is because no private character, however pure, no personal popularity, however great, can protect from the avenging wrath of an indignant people the man who will either declare that he is in favor of fastening the gold standard upon this people, or who is willing to surrender the right of self-government and place legislative control in the hands of foreign potentates and powers.
. . . Here is the line of battle. … Mr. Carlisle said in 1878 that this was a struggle between the idle holders of idle capital and the struggling masses who produce the wealth and pay the taxes of the country; and my friends, it is simply a question that we shall decide upon which side shall the Democratic Party fight. Upon the side of the idle holders of idle capital, or upon the side of the struggling masses? That is the question that the party must answer first; and then it must be answered by each individual hereafter. The sympathies of the Democratic Party, as described by the platform, are on the side of the struggling masses, who have ever been the foundation of the Democratic Party. … If they dare to come out in the open field and defend the gold standard as a good thing, we shall fight them to the uttermost, having behind us the producing masses of the nation and the world. Having behind us the commercial interests and the laboring interests and all the toiling masses, we shall answer their demands for a gold standard by saying to them, you shall not press down upon the brow of labor this crown of thorns. You shall not crucify mankind upon a cross of gold. Bryan (1860-1925), attorney, Democratic and Populist leader and magnetic orator who ran unsuccessfully 3 times for the U.S. presidency (1896, 1900, 1908). His enemies regarded him as an ambitious demagogue, but his supporters viewed him as a champion of liberal causes. He was influential in the eventual adoption of such reforms as popular election of senators, income tax, creation of a Department of Labor, Prohibition, and woman suffrage. Throughout his career, his Midwestern roots clearly identified him with agrarian interests, in opposition to those of the urban East. In recognition of his role in securing the Democratic nomination for Woodrow Wilson in 1912, Bryan was appointed secretary of state the following year. Despite his diplomatic inexperience, he made a distinctive contribution to world law by espousing arbitration to prevent war. Bryan convinced 31 nations to agree in principle to his proposal of new treaties that would provide a “cooling-off” period of one year during which a question in dispute could be studied by an international commission. In the meantime, World War I broke out. An avowed pacifist, Bryan resigned over Wilson’s second note to Germany (June 8, 1915) protesting the sinking of the Lusitania. Nonetheless, he urged loyal support of the war when it was finally declared. For more information see Wikipedia. “The Anti-intellectual Presidency“, Lim, Elvin — presented at the annual meeting of the American Political Science Association, 27 August 2003). Published in expanded form as The Anti-Intellectual Presidency: The Decline of Presidential Rhetoric from George Washington to George W. Bush. “An Infantilizing Speech“, Noah Millman, American Conservative, 31 August 2012 — He did so because he knows us so well. But they won’t: “What Democrats Should Be Talking About at the DNC“, Charles P. Pierce, blog of Esquire, 4 September 2012 – That would be politics. To see what we once were, compare the current election campaign with these excerpts from the Lincoln-Douglas Debates and the Federal Papers, mass-marketing politics of America-that-once-was: A report card for the Republic: are we still capable of self-government?, 3 July 2008. Next Post Why do so many Americans want a gold-based currency? You might want to explain a bit about the economic background of this speech. As I understand it, Bryan favored a change to silver-backed currency in a ratio of 16:1 as opposed to the gold standard. I believe that would have had the effect of increasing the money supply — but please correct me if I’m wrong. At the time, the lack of a central American bank like today’s Federal Reserve meant that economic depressions wrought great travail across America, with millions of families periodically losing their farms and their entire livelihoods, and entire communities getting wiped out by deflation, so increasing the money supply would have the effect of devaluing the assets of the rich and alleviating the economic suffering of poor people who had to pay back their debts in deflated gold-back dollars in times of depression. So Bryan’s political-economic position was vaguely similar to that of the Occupy movement today, except that it came from an established political figure in a venerable political party, and of course Byran held a political-economic position with a clear and specific set of economic policies attached to it (unlike the Occupy movement). The only American politicians who’ve dared to speak this way recently are Alan Grayson, who became radioactive even within his own party for speaking so bluntly and lost his career in congress, and Russ Feingold, who got chased out of the senate for his persistent statement of inconvenient facts. The point of the post is not the specific issues of turn-of-the-century America, but that they discussed them in a way rare today. As you note by the comparisons to Alan Grayson and Russ Feingold. There are many other examples. My favorite is Jimmy Carter’s “I have lusted in my heart” speech, a rare moment of truth for which he was mocked. Also George Romney daring to tell us the truth about Vietnam in August 1967, for which he was driven out of politics. Americans will tolerate much misbehavior by our leaders, but not truth. A great post and point. I am reading “The Black Book” by Senator Adlai E. Stevenson III (a compilation of his father + grandfathers writings)) that goes back to several generations of American public life. A positive reflection of political values as opposed to You Tube, and you have to think too. I notice Bryan made several references to ancient history that we probably wouldn’t get nowdays. How many people know the story of Cicero and the Cataline conspiracy? Of course, we can still have mature political debate without this broad general knowledge, but it makes it harder by limiting our range of reference. That’s a great point. Older political rhetoric gains much of its power by evoking history, both real, scriptural, and mythological. We’ve lost much of that, one reason our story-telling is so flat. On a broader level, mass market materials today have to be written at a far lower level than before. Novels and political speeches of the past are now to complex for a mass market. Not a good sign of our ability to manage an increasingly complex technological society. However, its good for our ruling elites, as it makes us easier to lead. True- society has become more complex as our language has become more shallow. It is maybe broader, but it’s still shallower. That’s not a good combination. The specialist is dead. All hail the generalist! I don’t believe it’s a specialist/generalist thing. It’s not just that we know less of our history and literature. The US public’s ability to read has decreased. We need shorter words, short and less complex sentences, and less complex overall literary structures. Not everything can be reduced to pretty pictures. It’s not just their ability to read, FM, but also their inclination. I remember reading a statistic in the past couple of years which claimed that only around 50% of Americans had read a book in the last six months…and since there have been studies finding that parents who read aloud to their children have better language and literacy skills, this has the disturbing potential to become a self-sustaining effect. Granted, it’s possible that the study was flawed and/or that the subjects didn’t consider reading to their children as being relevant to their answer…but it was a disquieting statistic nonetheless (especially for an avid reader like me). I see no particular reason to doubt it either, given the dismally high estimates of functional illiteracy in what is ostensibly such a prosperous country. Great point! These days no matter how bad the news, it can usually be topped by something worse. Of course there are certain aspects of this speech that merit criticism: “Cross of gold” has often been understood as anti-Semitic But you may say that I cavil. So if we were to seek to re-establish Bryanism in some meaningful sense, we should first lay a proper foundation. And that foundation would be a later day Chautauqua. The pablum that we are fed today. I agree with the description, but as a writer of a daily column I am sympathetic to the challenge faced by journalists. History is a story we tell to convince ourselves that events have meaning and can be understood (I believe I read this, but have never found the quote). The important thing is the depth and values of the story we tell. America seems to have come to love nothing but cartoons. 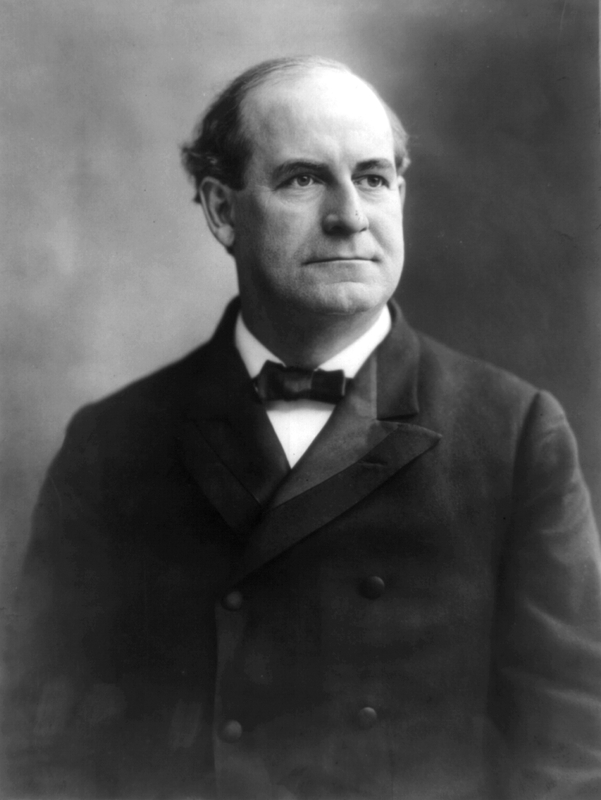 Modern historians have estimated that McKinley’s Republicans outspent Bryan by about 10 to 1, with some estimates even higher. They apparently they thought that ‘trickle down’ was the way to continue their control the government. Sound familiar? Bryan’s financial radicalism shocked financiers—they thought his inflationary program would bankrupt the railroads and ruin the economy. Hanna approached them for support for his strategy to win the election, and they gave $3.5 million for speakers and over 200 million pamphlets advocating the Republican position on the money and tariff questions. Bryan’s campaign had at most an estimated $500,000. … Most Democratic newspapers refused to support Bryan, the major exception being the New York Journal, controlled by William Randolph Hearst, whose fortune was based on silver mines. Our political conventions have become social events at which our ruling elites, minor and great, meet to socialize — renewing their interconnections and reestablishing group harmony. That’s because, for all intents and purposes, the parties agree. The “disagreements” are mostly to do with how large the increase in military spending is going to be, and how severely social services are going to be impacted. Every effort has been made to make sure that someone who might do something like loudly question the US’ unconditional support of Israel, or the need for a “missile shield” in Europe, doesn’t get a chance at the microphone. The travesties we’re seeing amount to a stage full of empty chairs while someone shouts talking-points over the PA system. Agreed. The differences between R and D are mostly about magnitudes (how much to tilt the tax code to benefit the rich and cut social services to the rest), how aggressively to widen our foreign wars — and about relative institutional preferences. The R and D each represent different constellations of powerful interest groups. Understanding this overall agreement between the parties explains the apparent polarization: to maintain group identity they exaggerate their differences. We see something similar in the first books of the Old Testament, how Israel differs so greatly from the ethnically and socially similar tribes nearby. In both cases elites use behavioral/stylist differences (about which pundits spend so much time gushing at conventions, as if these were fashion shows) and — especially — demonizing their opponents. Bush was Hitler. Obama, the Other, will end America as we know it. The fate of America’s prosperity, world peace, the survival of life on Earth all depend on this election. These are strategies designed to fool the simple-minded. They worked on shepherds in 2nd millenia BC Middle East. They work in America today. Perhaps Fabius would also consult Richard Hofstadter, noted observer and historian of American politics, on the subject of Mr. Bryan. He would find that Mr. Bryan was indeed an ancestor of the modern Tea Party Movement in that he had unlimited outrage and very limited range of view; that is an inflammable mixture of sentiment that easily consumes reasoned debate and compromise. Oh, and Mr. Bryan was part of the prosecution team – a consultant, I believe – in the infamous Scopes Monkey Trial. Be careful what you wish for and desire, because you may get it sooner than you think. Both the summary and the introduction to this post were, I believe, clear that we’re looking at Bryan’s as an example of a period in which there were substantial policy differences between the two major parties AND a higher degree of citizen involvement. Opinions will differ, but I believe that was a sign of vitality of our political regime. His views were those of a large fraction of the American public at that time. So what you and I think of the Scopes monkey trial is no more relevant than what people of 22nd century America will think of us (eg, our use of torture, aggressive foreign wars propping up tyrants, feckless fiscal policy). The key thing is that their views had political expression, unlike today when the public space is dominated by a narrow range of views — and without plutocrat sponsorship, policies have low odds of adoption. That’s IMO not a useful or even accurate statement. Comparing past and present politics is inherently difficult. Bryan and the TP are in some ways similar (eg, nativist, fundamentalist), and in some ways mirror opposites. The TP is largely a reactionary force of the right, favoring policies that benefit the existing social and economic orders — while Bryan wanted substantial reforms to those systems — coming from the left. This is why Bryan opposed the gold standard and favored an aggressive income tax — and why the TP loves gold and hates the income tax. Different times, but with respect to these things the same battle lines still exist. The TP people are modern versions of the affluent middle class voters that put McKinley in office. I think that’s a very difficult comparison to make vs our current candidates. IMO Bryan compares quite favorably on those criteria to Mitt Romney and Ryan. Certainly McCain and Palin had both lots of outrage and limited points of view. On the other hand, I wonder if such evaluations are useful as they’re so subjective. Why? What is this thing you fear? Agreed. No matter what one thinks of his views, he is the kind of person who contributes strongly to our political life. Opponents said that they felt good about America after debating him, even those who thought he was a radical. As for his views, looking at comments before Don’s, 19th century political debates don’t map well onto our 21st century labels. Too much has changed. It’s ironic. I just finished watching Bill Still’s documentary “The Secret of Oz” on Youtube before coming across this post. A very good documentary for anyone who hasn’t seen it yet! The excellence of political speeches unfortunately bears no relation to the quality of the policies advocated therein. JFK’s inaugural speech remains one of the great political speeches in all American history — alas, JFK sets forth lots of mostly bad ideas and a bunch of truly toxic policies. For example “We will pay any price, bear any burden” to encourage freedom in other countries. This led to Vietnam, the Iraq invasion of 2003, the Afghanistan quagmire, etc. Good point, one that was made in the post and several times in the comments. But this speech is part — a manifestation — of a broad-based popular movement — not astroturf — designed to achieve clear policy goals. IMO that sort of citizen involvement is necessary for us to reform and revitalize the Republic, resisting the slide to plutocracy.